NVIDIA Home > Support Home Page > Knowledgebase Home Page > 3D Vision I can’t playback Blu-ray movies on the 120Hz monitor. 3D Vision I can't playback Blu-ray movies on the 120Hz monitor at 120Hz. To workaround this monitor issue please reduce the display refresh rate to 60Hz. 1. 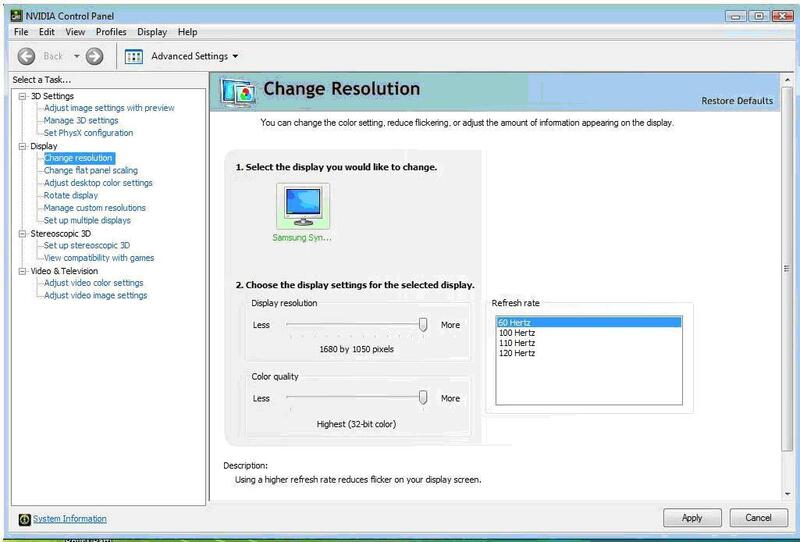 To select a 60Hz screen refresh rate right click on the desktop and click NVIDIA Control Panel. 3. From the Refresh rate list, choose 60 Hertz and apply. 4. Insert Blu-ray disc into the Blu-ray player. 5. Open your Blu-ray / DVD playback software and play the movie. *Please return the refresh rate setting to 100 to 120 Hertz for proper 3D Stereoscopic use when you're finished viewing Blu-ray movies. If I have purchased NVIDIA 3DTV Play, do I need additional software for Blu-ray 3D movie playback? Do I need 3DTV Play to watch Blu-ray 3D movies when connected to my HDMI 3D TV?